Covington’s Morgan Kimmel scores on a layup Monday night. 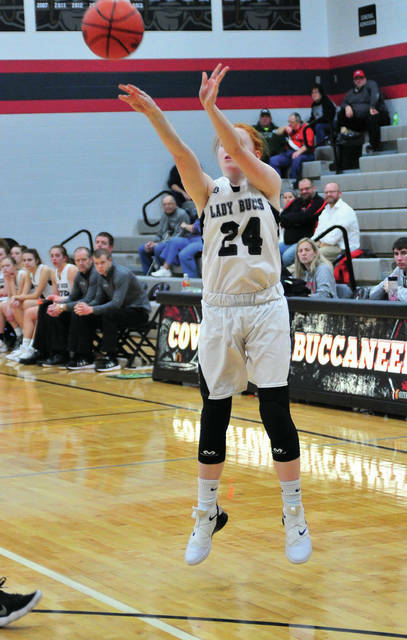 Covington’s Claudia Harrington shoots a 3-pointer Monday night. 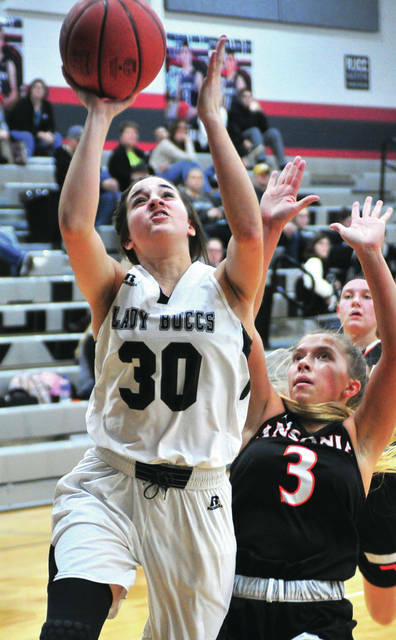 Covington’s Makenzee Maschino shoots against Ansonia’s Trinity Henderson Monday night. Covington’s Lauren Christian shoots over Ansonia’s Kierra Reichert (23) Monday night. Covington’s SammiWhiteman drives to the basket Monday night. COVINGTON —- Coming off a tough loss to Miami East girls last Thursday, the Covington girls basketball team was just looking to have some fun Monday night. And while Ansonia played hard the entire game, Covington did exactly that, picking up a 69-25 win over the Tigers in CCC action. Covington improved to 16-3 overall and 9-2 in the CCC, while Ansonia dropped to 2-18 overall and 1-10 in the CCC. 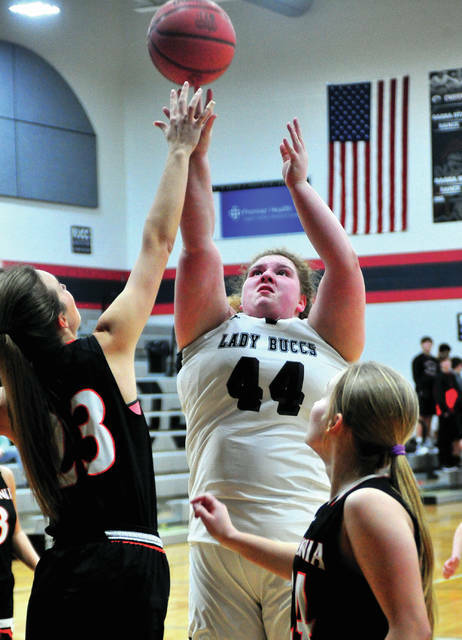 After Sammi Whiteman scored eight of the Buccs first 10 points as Covington took a 10-1 lead, Morgan Kimmel showed a perfect example of that. Kimmel got the ball near the top of the key and was driving the lane and could have shot a contested layup. Instead, she dished the ball to Claudia Harrington for an easy basket. And Lauren Christian had one of her best shooting nights. In fact, three of the seniors had big games. 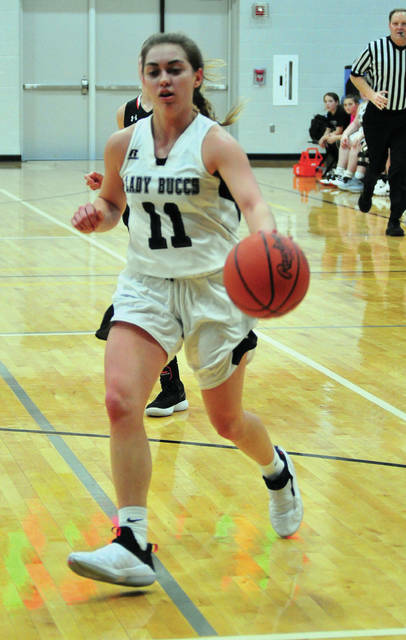 As Covington stretched a 17-7 first quarter lead to 37-12 at halftime and 60-15 after three quarters before emptying the bench, Whiteman made the most of her final quarter on the floor. She scored 17 points in the third quarter, going 8-for-11 from the floor in those eight minutes and finished with 31 points. Christian made seven of 10 shots from the floor, got a big cheer when she saw some action at point guard and finished with 14 points and seven rebounds. And Lillian Hamilton grabbed seven rebounds and scored six points. Claudia Harrington added seven points and 12 rebounds —- and both Kimmel and Morgan Lowe grabbed five rebounds each. Trinity Henderson led Ansonia with 13 points and six rebounds, while Mariah Troutwine had 11 points and five rebounds. 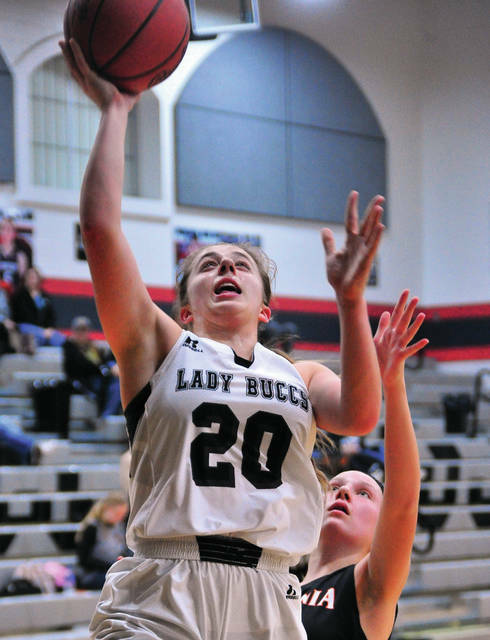 Makayla Stover also grabbed five rebounds. Covington was 30 of 66 from the floor for 45 percent and made all six of its free throws. Ansonia was 12 of 48 from the floor for 25 percent and three of five from the line for 60 percent. Covington dominated the boards 46-25 and had just seven turnovers to the Tigers 16. “It was just nice to see how well everybody played and how much fun they had,” Meyer said. And they will look to continue that with a road trip to National Trail Thursday to finish CCC play, before playing two D-I foes next week in Troy and Greenville before heading down the tournament trail. Mariah Troutwine 4-0-11, Trinity Henderson 5-1-13, Kierra Reichert 0-0-0, Makayla Stover 2-0-5, Rylie Marker 1-1-4, McKenna Obringer 0-0-0, Heidi Runkel 0-0-0, Sky Edwards 0-0-0, Emily Wright 0-0-0, Emma Barga 0-1-1. Totals: 12-3-34. Morgan Lowe 1-0-2, Sammi Whiteman 13-3-31, Morgan Kimmel 1-0-2, Claudia Harrington 3-0-7, Lauren Christian 7-0-14, Lillian Hamilton 3-0-6, Makenzee Maschino 2-0-4, Leah Poling 0-0-0, Brenna Miller 0-0-0, Josie Crowell 0-3-3, Autumn Rich 0-0-0. Totals: 30-6-69. 3-point field goals —- Ansonia: Troutwine (3), Henderson (2), Stover, Marker. Covington: Whiteman (2), Harrington. Records: Ansonia 2-18 (1-10), Covington 16-3 (9-2). Reserve score: Covington 48, Ansonia 28.